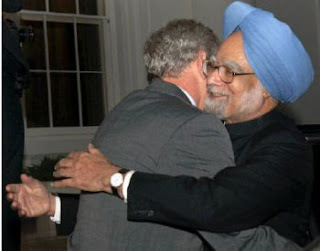 "The people of India deeply love you", said Indian Prime Minister Manmohan Singh to President Bush on a recent visit to the White House. The Program on International Policy Attitudes (PIPA) poll that Mr. Menon referred to shows that India tops the world in its admiration for President Bush who is deeply unpopular in the United States and most of the rest of the world. The survey found that 62% of Indians thought his second term as US president was positive for global security. Another most recent PIPA poll conducted in 2008 shows that the one country with a majority expressing a positive view of Bush is Nigeria with 60 percent saying they have some or a lot of confidence. Indians also lean positive (45 to 34%). Interestingly, this year Chinese views have softened (41% positive, 45% negative)--with the number of those expressing positive views up 10 points since Pew's 2007 poll. India has benefited from the Bush policies of closer economic and nuclear cooperation which led to India's rapid economic growth in recent years, and its acceptance as a legitimate member of the prestigious nuclear club, a distinction not bestowed on nuclear rival Pakistan. The US-led war on terror has also legitimized India's crackdown on Islamic and other insurgents and helped India regain influence in Afghanistan and South Asia. Bush's pressure on Musharraf was instrumental in reducing violence in Indian held Kashmir and India, a Musharraf policy that angered the Islamists who started targeting Pakistani civilians and military. Bush popularity is, therefore, based on concrete results India achieved from the support of the outgoing US president. The Americans clearly see India as a strategic partner and a counterweight to China's growing influence in Asia, Middle East and Africa. While the US has made the effort to cultivate close friendship with Indians, it is not clear how this partnership will unfold in terms of specific Indian policies to help the US. Isolating Iran is one its goals where the US wants India's help. Energy-hungry India needs Iran-Pakistan-India gas pipeline project to move forward. The US is clearly opposed to it. How will India respond to the US pressure? Alastair Scrutton, Reuters Chief Correspondent in Delhi, has addressed this in an analysis of the nuclear deal, saying those hoping that India will now fall into line with western policy will be disappointed. Scrutton quotes Brahma Chellaney as saying that India will be reluctant to get sucked into U.S. efforts to isolate Iran. I have a feeling that the I-P-I gas pipeline will be built with or without the US blessing. The reason is simple: Both India and Pakistan are energy-hungry and Iran is the closet source of abundant natural gas for South Asia. It is in their own best national interest to defy the U.S. on this particular issue. The only thing that is likely to delay it significantly is the deep distrust between India and Pakistan where U.S. can and must play a role regardless of the I-P-I project. It is in U.S.’s best interest to do so for its own economic and strategic interests in South Asia. I think Bush support in India is mainly due to sympathy with 9/11 attacks (in which 233 Indians also died) and massive response in Afghanistan against Taliban.Indian public clearly despises Taliban for facilitating IC-814 Hijack and Bahmia Buddha demolition.There were widespread coverage of (BBC clip?) showing them executing two women in the Stadium.The Iran-Pakistan-India pipeline is already dead with Iran (again)revising prices to unattractive levels.Iran will still remain an important gas supplier by transporting via other means.More than Pak,India doesn't trust the present conservative govt,it turned the tables on number of things and definitely don't like India's close ties with US-Israel.Moreover, there are informal agreements with US to get the deal through.One of them is to sabotage the IPI pipeline other visible one is quota for US nuclear companies and finally a test ban for the period of nuclear deal until India get its thorium technology working (10-20years).I think from various strategic analysts,I get the impression that India is pursuing multiple gas and oil suppliers and IPI's indispensability is overestimated(in ur article)for India.From the looks of it, Pak is going to go alone with pipeline with Iran, may be a transit route will be China. I think 9/11 is just a footnote in growing US-India ties, the foundation of which was laid by Clinton and Vajpayee prior to 9/11. Manmohan's hyperbole aside, I think India will do whatever it finds to be in its best national interest. It seems the I-P-I is in India's best interest to sustain its economic growth. The alternatives do not seem as appealing or practical. The price negotiations will not be a an obstacle when Iran and India recognize they need each other for reasons beyond the energy deal. Iran is no Sudan or Myanmar. If India goes full throttle with Iran ties hypothetically,Israel,US/UK and Arab states will cut ties with India. I greatly respect Iranian people,their rich culture,progressive thinking and their strides in technology. But with a nutjob like Ahmedinajad(with equally nutty Super Ayatollah pulling strings) at its helm,its making a mockery out of itself like Chavez. Except that a nuclear-armed Iran with a nutjob presiding over is not funny.That guy is embarrassing even to shake hand with,with his messianic ego and anti-semitism.India is seriously reviewing Iranian relationship on a short-term(until saner liberals get some grip).The pointers are: IAEA vote against Iran,launching Israeli spy satellite,IPI delay/death.I don't think there is more than a hi-bye relationship as of now.For Afghanistan reconstruction, since Pak had disallowed Ind->Afghan land transit route, only way is Iranian route for goods.Also if much predicted Taliban take over Afghanistan happens, adversaries like NA have to be re-supplied with weapons and logistics through Iran's help. Israel(a technological powerhouse) have a strong grip and influence over India since Indian military needs high-tech weapons to protect itself as some of those technologies doesn't even exist with traditional suppliers. So giving a finger to Israel by aligning with its mortal enemy is a death-wish for India.Case in point: when some Israelis officials met Pak's due to disillusionment with newly formed UPA Govt(2004) stopping momentum in its ties,there was panic in Foreign Ministry and it immediately took a U-turn in its policy and now ironically,ties are better than even in when NDA govt was in power.